So here comes the post. Decades late, I know. Exaggeration, I know. I have a lot to say Alhamdulillah for last year, the year I think I've grown a lot compared to before. Looking back, I know I made a lot of mistakes - a LOT - but I'm grateful that over time I managed to acknowledge them and see the flaws that I am. I learned not to depend on others and stand on my two feet - my two SMALL feet (hehe) - and it felt great when the result is beyond my expectation. Alhamdulillah. I learned not to envy others so much and be thankful of what I have, and be happier. And I mean, HAPPIER. I've never felt so much love and passion, be it in relationships or studies or just, life. Seriously, let go of things that you feel always seem to hold you back. Sometimes that's all you need. But I also learned to love Mr. Coke. NOT A GOOD THING, SERIOUSLY. I used to hate soda and cold drinks cause my tongue couldn't cooperate well with gassy drinks, but after being introduced to Mr. Coke I can safely say my health system is violated. Damn you Coke. I learned to spend less on magazines cause magazines cost a LOT here in Japan. I learned to cook more often after seeing just how much the boyfriend detests instant food..(ummm you like pizza kan?? Hehehe) And honestly, I know I won't be improving my eating habit if not for him. Growing up with McD's burgers and KFC's spicy chicken made it harder for me to learn to love steamed fish and spinach, but having him by my side to say things like "TOO MUCH OILLL" "MAKANLAH BESOK UMUR 30 BOLEH POTONG KAKI" "TOO MUCH SUGARRR" really helped me realize important stuffs that I've always missed to notice. So thank you. I learned to organize my wardrobe better. I learned that finishing your final year isn't easy, but the final year is definitely the most exciting year of all. FYP is tough but you learn new things everyday, and the feeling of completing it in the end is worth it. What more for engineering students, you know, there's a reason why engineering degree takes four years (in Japan) to be completed and why having a Masters degree in engineering is considered genius. The Big Bang Theory and 3 Idiots proved it. I learned to participate in gatherings more. Socializing doesn't hurt if not go overboard. I learned that a messy tudung for a day actually doesn't hurt. Vain much? Hehe. Yes I was one of the girls who'd ditch classes/lectures/inspections/meetings/dates(yes seriously) if my tudung was messy that day. I learned not to put my relationship out in the open too much; cause as my mum always say it's no good until everything is certain. I know we can only plan, but it's all in God's hands. So I'm trying not to expose things too much, and I know people don't like to read cheesy things. Hehe. I learned to accept things as they are, and that being comfortable in your skin is important. You don't have to have people's approval of your looks, as long as you're happy and God's happy then it's all that matters. I know sometimes me being the ordinary human being would occasionally make mistakes, sometimes I don't realize people are watching my every move, so I'm truly sorry if I'm giving out the wrong message to you out there with my choices. Yang baik itu datang dari Allah, yang buruk itu dari saya sendiri. How else would we learn, right? As one of my new-things-to-discover list of 2011, I've decided to try webcam-whoring. Please, all the girls in the world have done it. RIGHT? 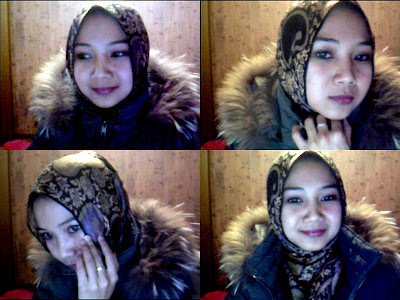 Was about to go out to buy some groceries and decided to put on the new shawls and see how it turned out. OK webcam-whoring isn't so bad..just don't do it everyday.